We all overeat from time to time, taking an extra helping at parties or having dessert when you’re already full. But for binge eaters, overeating is regular and uncontrollable. You use food to cope with stress and other negative emotions, even though afterwards you feel even worse. You may feel like you’re stuck in a vicious cycle, but binge eating disorder is treatable. With the right help and support, you can learn to control your eating and develop a healthy relationship with food and the Why Weight Ireland plan can help you with this. Binge eating disorder is characterized by compulsive overeating in which people consume huge amounts of food while feeling out of control and powerless to stop. The symptoms of binge eating disorder usually begin in late adolescence or early adulthood, often after a major diet. A binge-eating episode typically lasts around two hours, but some people binge on and off all day long. Binge eaters often eat even when they’re not hungry and continue eating long after they’re full. They may also gorge themselves as fast as they can while barely registering what they’re eating or tasting. ▪ Frequent episodes of uncontrollable binge eating. ▪ Feeling extremely distressed or upset during or after bingeing. ▪ Unlike bulimia, there are no regular attempts to “make up” for the binges through vomiting, fasting, or over-exercising. 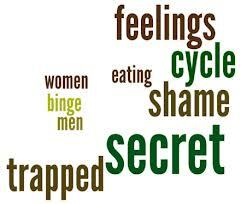 People with binge eating disorder struggle with feelings of guilt, disgust, and depression. They worry about what the compulsive eating will do to their bodies and beat themselves up for their lack of self-control. They desperately want to stop binge eating, but feel like they can’t. Binge eating may be comforting for a brief moment, but then reality sets back in, along with regret and self-loathing. Binge eating often leads to weight gain and obesity, which only reinforces compulsive eating. The worse a binge eater feels about themself and their appearance, the more they use food to cope. It becomes a vicious cycle: eating to feel better, feeling even worse, and then turning back to food for relief. People with binge eating disorder are embarrassed and ashamed of their eating habits, so they often try to hide their symptoms and eat in secret. Many binge eaters are overweight or obese, but some are of normal weight. ▪ Feeling numb while bingeing—like you’re not really there or you’re on auto-pilot. Ask yourself the following questions. The more “yes” answers, the more likely it is that you may have binge eating disorder. ▪ Do you feel out of control when you’re eating? ▪ Do you think about food all the time? ▪ Do you eat in secret? ▪ Do you eat until you feel sick? ▪ Do you eat to escape from worries, relieve stress, or to comfort yourself? ▪ Do you feel disgusted or ashamed after eating? ▪ Do you feel powerless to stop eating, even though you want to? Binge eating leads to a wide variety of physical, emotional, and social problems. People with binge eating disorder report more health issues, stress, insomnia, and suicidal thoughts than people without an eating disorder. Depression, anxiety, and substance abuse are common side effects as well. But the most prominent effect of binge eating disorder is weight gain. Generally, it takes a combination of things to develop binge eating disorder — including a person’s genes, emotions, and experience. Biological abnormalities can contribute to binge eating. For example, the hypothalamus (the part of the brain that controls appetite) may not be sending correct messages about hunger and fullness. Researchers have also found a genetic mutation that appears to cause food addiction. Finally, there is evidence that low levels of the brain chemical serotonin play a role in compulsive eating. Social pressure to be thin can add to the shame binge eaters feel and fuel their emotional eating. Some parents unwittingly set the stage for binge eating by using food to comfort, dismiss, or reward their children. Children who are exposed to frequent critical comments about their bodies and weight are also vulnerable. One of the most common reasons for binge eating is an attempt to manage unpleasant emotions such as stress, depression, loneliness, fear, and anxiety. When you have a bad day, it can seem like food is your only friend. Binge eating can temporarily make feelings such as stress, sadness, anxiety, depression, and boredom evaporate into thin air. But the relief is only very fleeting. It can be difficult to overcome binge eating and food addiction. Unlike other addictions, your “drug” is necessary for survival, so you don’t have the option of avoiding it. Instead, you must develop a healthier relationship with food—a relationship that’s based on meeting your nutritional needs, not your emotional ones. In order to stop the unhealthy pattern of binge eating, it’s important to start eating for health and nutrition. Healthy eating involves making balanced meal plans, choosing healthy foods when eating out, and making sure you’re getting the right balance in your diet. Our Why Weight Ireland online food & exercise diary will help you with just that, as well as having the ability to track your food triggers. ▪ Manage stress. One of the most important aspects of controlling binge eating is to find alternate ways to handle stress and other overwhelming feelings without using food. These may include exercising or meditating. ▪ Eat 3 Meals a Day Plus Healthy Snacks. Eating breakfast jump-starts your metabolism in the morning. Follow breakfast with a balanced lunch and dinner, and healthy snacks in between. Stick to scheduled mealtimes, as skipping meals often leads to binge eating later in the day. Use your diary to plan your days food properly. ▪ Avoid Temptation. You’re much more likely to overeat if you have junk food, desserts, and unhealthy snacks in the house. Remove the temptation by clearing your fridge and cupboards of your favorite binge foods. ▪ Stop Dieting. The deprivation and hunger of strict dieting can trigger food cravings and the urge to overeat. Instead of dieting, focus on eating in moderation. Find nutritious foods that you enjoy and eat only until you feel content, not uncomfortably stuffed. Avoid banning certain foods as this can make you crave them even more. This is what the Why Weight Ireland plan is all about – no food is off limits and I’ve said from the start, “It’s not just a diet, it’s a new way of life”. ▪ Exercise. Not only will exercise help you lose weight in a healthy way, but it also lifts depression, improves overall health, and reduces stress. The natural mood-boosting effects of exercise can help put a stop to emotional eating. Make sure you use your diary to track your exercise. ▪ Fight boredom. Instead of snacking when you’re bored, distract yourself. Take a walk, call a friend, read, or take up a hobby. ▪ Get Enough Sleep. If you’re tired, you may want to keep eating in order to boost your energy. Take a nap or go to bed earlier instead. ▪ Listen to Your Body. Learn to distinguish between physical and emotional hunger. Use your food trigger section in your diary to track this. If you ate recently and don’t have a rumbling stomach, you’re probably not really hungry. Give the craving time to pass. Try the 20 min rule – wait for 20 minutes after you eat before you eat something else; the chances are you’ll not be hungry like you thought you were. ▪ Keep a food diary updated. Enter in what you eat, when, how much, and how you’re feeling when you eat. You may see patterns emerge that reveal the connection between your moods and binge eating. ▪ Get Support. You’re more likely to succumb to binge eating triggers if you lack a solid support network. Talking helps, lean on family and friends, join a support group, and if possible consult your GP. Warning signs that a loved one is bingeing include finding piles of empty food packages and wrappers, cupboards and refrigerators that have been cleaned out, and hidden stashes of high-calorie or junk food. If you suspect that your friend or family member has binge eating disorder, talk to the person about your concerns. It may seem daunting to start such a delicate conversation, and your loved one may deny bingeing or become angry and defensive, but there’s a chance that he or she will welcome the opportunity to talk about their painful struggle. If the person shuts you out at first, don’t give up; it may take some time before your loved one is willing to admit to having a problem. And remember: as difficult as it is to know that someone you love may be have an eating disorder, you can’t force someone to change. The decision to seek recovery has to come from them. You can help by offering your compassion, encouragement, and support. I am not a therapist so all my comments and statements on any of my blogs are my own and are based on my own life experiences and on research completed. As someone who has lost almost eight stone, a fitness professional and owner of a weight loss & fitness business, I have a lot of knowledge and experience that I try and share with you and give you the opportunity to take the advise on board. If you think you may suffer or know someone who suffers from an eating disorder you can call BodyWhys – The Eating Disorder Association of Ireland – Lo-Call Helpline 1890-200-444 or email alex@bodywhys.ie for private and confidential support. Research for the above post was done with the help of Harvard Health Publications, Harvard Medical School & Helpguide.